Evolving Visions of the Priesthood traces the movement of the Church in the United States during the first forty years of the implementation of Vatican II. This research gives the U.S. Church a good picture of itself and its struggles during the post-conciliar period. These studies are important for what they tell us of priests who were already ministering the theology of the Council, at the time of the Council, and also consider those priests ordained more recently and their perspectives on Vatican II. How the different groups of priests perceive each other in their respective desires to be faithful to God offers the reader insight into today's presbyterate. By following what has been happening we get a glimpse of what the future holds. Given the struggles of the scandals recently confronting the Church, the studies also offer indications of why the particular problems arose so suddenly and why they were so related to a given time frame. Dean R. Hoge is a professor in the department of sociology at The Catholic University of America in Washington, D.C. He has done sociological research serving American churches for 32 years and has authored several books and articles on American religion including The First Five Years of the Priesthood, published by Liturgical Press. Jacqueline E. Wenger is a graduate student in sociology at The Catholic University of America and a licensed clinical social worker. Here is a clear picture of U.S. priesthood with all its contrasts and challenges. Hoge and Wenger bring us the voices of the men themselves and spell out their often conflicting visions and aspirations. There are no bad guys and good guys here, just idealistic partisans of complementary hopes caught up in the turbulence of a changing Church. Buy it! Read it! You need to know the truth about the future of ordained ministry. Evolving Visions of the Priesthood will put to rest the rumors and hunches circulating in Catholic circles about young priests. . . . Hoge and Wenger have provided the research many have been asking for, but without making judgments about the value of one approach to priesthood over another. A few of those giving reactions at the end of the study suggested both approaches were necessary in order to maintain a balanced understanding of priesthood. . . . The research and antidotes contained in this book do not provide an answer. They do give concrete information abut present attitudes among priests, both old and young, and identify where the differences and similarities lie. This is valuable data that should not be overlooked by anyone interested in the ongoing formation of priests, in working on parish staffs or ministering in Catholic parishes. The book provides solid insight as well as poignant anecdotal snapshots of what it is really like to be a priest. 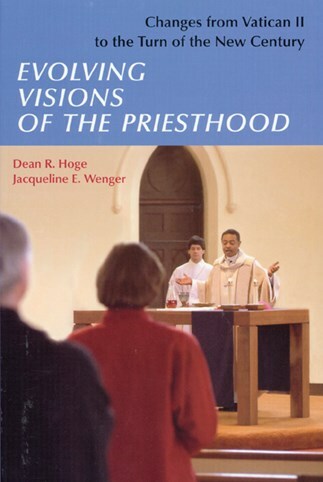 Evolving Visions of the Priesthood is undoubtedly a significant book. Hoge and Wenger's first-rate research and reliable analysis create yet another enormous agenda for the Catholic Church in the United States. They make us aware not only of the conflicting views of various generations, but also of potential starting points for needed dialogue. Their book is essential reading for everyone involved in pastoral leadership and would be valuable for those with broad interest in the churchs future and their role in it. . . . Evolving Visions of Priesthood offers an invitation to work toward overcoming separation wherever it exists and replacing it with true communion.
. . . a book anyone interested in the future of the church's ministry must read.
. . . provides updated information on changes in priests' attitudes toward ecclesiology, the needs of priests, and other important issues since the end of Vatican II in 1965.